Ticks are bloodsucking parasites of domestic and wild animals that are found worldwide. Among the external parasites of dogs and cats, ticks belong to the most harmful because they can transmit numerous microbial diseases. Ticks occur worldwide, but the species prevailing in each region are different. As a general rule, tick species found in tropical and subtropical countries (Southern USA, Australia, South Africa, etc.) are different from those in countries with a cold winter (e.g. Canada, Northern USA, Europe, etc.). In tropical and subtropical regions ticks are more frequent in rural zones with abundant livestock than in dense forests, and are active year round. In regions with a cold winter ticks are more frequent in and around forests than in pastureland, and are active only from late spring to early autumn. Dogs are much more affected by ticks than cats, simply because cats are less likely to get into tick territory: they seldom get there by their own, and nobody takes its cat for a walk. And tick infested cats are much more likely to get rid of the ticks by themselves than dogs, because of their intensive self-grooming behavior. Before taking their blood meals, ticks that infest pets are rather small: larvae are smaller than 1 mm, nymphs are 1-2 mm long, and adults are 3-5 mm long, depending on the species. But engorged adult females of certain species can be up 2 cm long (like a large bean or a hazelnut) and more, 50 to 100 times larger in volume than unfed. Click here to learn more about the general biology of ticks. Which tick species are important for dogs and cats? Amblyomma: mainly in America and Africa. Species-specific distribution. Amblyomma americanum and Amblyomma cajennense in America. Dermacentor: worldwide. Species specific distribution. Dermacentor reticulatus in Europe, Dermacentor variabilis in North America. Haemaphysalis: worldwide, excepting Americas. Species-specific distribution. Hyalomma: mainly in Europe and Asia. Species-specific distribution. Ixodes: worldwide. Species-specific distribution. Ixodes ricinus in Europe, Ixodes scapularis in North America. Rhipicephalus: worldwide. Species-specific distribution. Rhipicephalus sanguineus worldwide. Among the soft ticks, Otobius megnini, which is often found in the ears of dogs, can be a local problem in Latin America. You can learn more about these different ticks in the specific articles in this site. For a pet owner that finds ticks on its dog or cat it is not very important to know the particular species. However, knowing the species is important for the veterinary doctor, because not all tick species transmit all tick-borne diseases. Therefore, if possible, the concerned tick(s) should be picked off and brought to the veterinary clinic to be determined. If a pet has got more than one tick, most of them are likely to be of the same species. With very few exceptions all species that affect cats and dogs affect livestock, wildlife and humans as well. Where do ticks live and how can a pet get infested with ticks? The vast majority of ticks species live outdoors, especially in places used by livestock (cattle, sheep, goats) and/or wildlife for grazing and resting, whereby small mammals (e.g. rodents, rabbits, hedgehogs, etc.) and birds are often important hosts as well, especially of immature tick stages (i.e. larvae and nymphs) that can also infest pets and humans. Ticks can also be abundant in peri-urban parks, recreational and residential areas, especially if they are also visited by wildlife. Ticks are usually not present in cropland, but can be found on its border. There is one particular tick species that can complete development indoors, the brown dog tick (Rhipicephalus sanguineus), which occurs worldwide and is often a pest in kennels, dog pounds, etc. Therefore it is unlikely that a dog (or its owner) gets ticks indoors. However, if a pet gets ticks, brings them home and engorged adult females drop to the ground somewhere in or around the building, such females will lay eggs by the thousands. And microscopic larvae that hatch out of the eggs can indeed infest pets and/or humans. Such larvae are very unlikely to complete their development to adult ticks (excepting the previously mentioned brown dog tick) and will probably remain unnoticed, but larvae of certain species are also capable of transmitting tick-borne diseases. Ticks (either larvae, nymphs or adults) do not actively search for a host, but instinctively climb to the tip of grasses or on leaves of shrubs and bushes in the vegetation, where they wait for a suitable host to pass by. This behavior is called questing. When a suitable host passes by and touches the grass or the leaves, the questing ticks just hang on to it. They recognize a suitable host by its body heat and exhaled CO2 (carbon dioxide), which they can perceive with sensory organs, e.g. the so-called Haller's organ in their legs. After getting onto a host, hard ticks (either larvae, nymphs or adults) will crawl around in its hair coat for 1 to 2 hours searching a good place to bite (which can be species-specific, e.g. the ears). Once they feel comfortable they will attach and start their blood meal, which can last for days. After the blood meal they drop to the ground for molting or egg laying. It is extremely unlikely that an undisturbed tick that has found a host abandons it without attaching and feeding. After dropping they do not move away. Larvae and nymphs molt to the next stage in a few days and start again questing. Engorged females deposit their eggs during several days and die. Larvae that hatch out of the eggs immediately start questing without moving away. As a consequence of this behavior, the highest number of infesting ticks will be found in and around those places that are most visited by livestock (especially cattle) and/or wildlife: water and feeding points, preferred resting places (e.g. below large trees in the pastures), etc. In tick endemic areas, especially in tropical and subtropical regions, if a dog walks through such a place, it may pick dozens if not hundreds of ticks. This behavior means that hard ticks neither jump onto their preys, nor drop down from the trees. Australian Ixodes holocyclus seems to be an exception: it does climb trees and falls down onto people sitting underneath. As a general rule hard ticks are not transmitted from one animal to another one, neither within a herd, nor from pets to humans, nor among pets. This is different for soft ticks. Their blood meals are shorter and they leave the host repeatedly, to come back again. Between the meals they remain in their nests, which they leave for a new meal on whatever host they can attach to. The good news is that soft ticks are significantly less abundant than hard ticks in most regions of the world. What harm can cause ticks to dogs and cats? Tick bites are usually not painful for the pets. The reason is that ticks introduce natural painkillers with their saliva to increase the chance for remaining unnoticed by the host during the daylong blood meal. However, if a pet gets dozens of ticks, it may well be significantly annoyed by the ticks themselves, regardless of whether it becomes infected with a tick-borne disease or not. Blood loss due to a few ticks is irrelevant for a pet's health. Most dogs and cats will usually catch only a few ticks. But if a pet gets bitten by hundreds of ticks, blood loss can certainly lead to anemia. In tropical and sub-tropical regions, the small injuries caused by tick bites can attract parasitic flies that lay their eggs on this wounds (e.g. screwworm flies) and develop into cutaneous myiases. Fly larvae that hatch out of the eggs feed on the pet's tissues and can cause severe injuries if left untreated. Poisoning is another possible harm caused by tick bites. Ticks do no inject a strong toxin as snakes, spiders or scorpions. But the tick's saliva contains a complex mix of several substances that strongly affect the host's immune system. For several tick species this can lead to a general toxemia (= poisoning) of the host. Such toxemia can lead to paralysis of the host that can be fatal. This is the case for Ixodes rubicundus in Southern Africa that can caused tick paralysis on sheep; Ixodes holocyclus in Australia that can cause tick paralysis of humans, dogs and cattle; and Dermacentor andersoni that can cause tick paralysis of cattle in North America. Hyalomma truncatum causes the sweating sickness in Northern Africa, which is characterized by massive hair loss (alopecia). The major threat for pets coming from ticks is transmission of tick-borne diseases. Almost all tick species transmit one or more tick-borne diseases, e.g. anaplasmosis, babesiosis, borreliosis (=Lyme disease), ehrlichiosis, hepatozoonosis, meningoencephalitis, etc. But not all species transmit all the diseases. Which tick species transmit which disease is regionally different. Most veterinary doctors know which tick-borne diseases a particular tick species transmits in a specific region. These diseases affect mainly dogs, but cats in rural areas can also be affected. Humans may be affected by some of these tick-borne diseases as well, but only if they are also bitten by ticks, not because the disease that affects the pet is contagious for humans (as e.g. influenza). As previously mentioned, it is also extremely unlikely that a tick that has bitten a pet will afterwards bite its owner and transmit the same disease. The clinical symptoms of tick-borne disease are frequently unspecific and early diagnosis is not always easy. Unfortunately it is not rare that diagnosis is done too late. In the following the most relevent symptoms of tick-borne diseases are summarized. Anaplasmosis, caused by several species of the genus Anaplasma, a rickettsial microorganism. Often the only noticeable symptom is high fever. Other signs can be lack of appetite, weight loss, diarrhea, vomiting, inflammation of the joints with paralysis, neurological symptoms. This disease can also affect humans. Babesiosis, (also called piroplasmosis) caused by several species of the genus Babesia, a unicellular microorganisms (protozoan). It causes high fever and often dark brownish urine. An acute outbreak can easily kill the pet. If the pet overcomes the acute phase, general weakness, lack of appetite, weight loss and jaundice can follow. Canine babesiosis does not affect humans. Other Babesia species can be pathogenic for humans. Borreliosis, caused by several species of the genus Borrelia, a bacterial microorganism agent of Lyme disease. Initially fever, lack of appetite and lethargy are often noticed. Later swollen, painful joints and paralysis, often intermittent. In its final stage heart, liver and/or kidney damage can follow with mostly fatal development. This disease can affect also humans. Ehrlichiosis, caused by bacteria of the genus Ehrlichia, a rickettsial microorganism. It can take years to show clinical symptoms. Tiredness, reluctance to walk and lack of appetite are usually the first signs. Nasal bleeding, swollen limbs, rash, coughing and difficult breathing, blood in urine faces and spitting may also develop. If left untreated it becomes easily chronic and fatal development is not uncommon. This disease can occasionally also affect humans. Meningoencephalitis, caused by a virus (can be caused by other microorganisms unrelated to ticks). Clinical signs are seldom. They have been reported mainly for large dogs with fatal development. The include fever, neurological signs (epileptic attacks, hyperexcitation, motor dysfuntion, etc.). This disease can also affect humans. Tick paralysis, caused by toxins of certain tick species. Signs develop a few days after the tick's bite and include general weakness that develops to paralysis of the hindlimbs. Soon after complete paralysis of the limbs. In case of respiratory paralysis preceded by difficult breathing death can follow in a few more days. Tick paralysis is rare in humans; children are more at risk. Hepatozoonosis, caused by several species of the genus Hepatozoon canis, a protozoan microorganism. Infection is not acquired through a tick's bite but through swallowing or chewing a tick. Most infections remain unnoticed and have a mild development without clinical signs. If the disease breaks out the symptoms depend on the affected organs. Fever, anemia, weight loss swollen lymph nodes, nasal and ocular exudation, bloody diarrhea and muscular weakness have been described. Severe cases can be fatal due to irreversible organ damage. This disease does not affect humans. A single tick can transmit the disease! But it is important to know that this does not always happen. 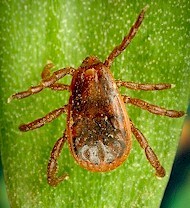 Successful transmission of the disease occurs several hours after the tick has started biting, depending on the tick species and the disease. The longer the bite, the higher the risk of disease transmission. This is why it is important to find the ticks and to remove them as early as possible. Therefore, after a dog has been outdoors in a risky environment it should be throroughly inspected, if possible not later than 12 hours after the walk. It is not recommended to inspect the pet immediately after the walk because unfed ticks are rather small and difficult to notice. About 12 hours later they have started to engorge and are easier to find. The risk of becoming infected with a tick-borne disease depends strongly on the region and the season. The number of active ticks in a region varies along the season (winter versus summer, or humid versus dry). And not all ticks are infected with microbial pathogens. The infection rate of ticks varies considerably from one region to another one. By an infection rate of 10% only 1 in 10 ticks are infected with pathogens. But the pathogens can be more or less virulent in certain tick populations than in other ones. If the pathogen is only mildly virulent, many bitten and infected hosts will not develop the disease because it is neutralized by the host's immune system. All this can result in a risk of <1% of developing the disease if bitten. But if the pathogen is highly virulent, many infected pets will develop the disease. This can result in chances of developing a disease of >10%. Unfortunately, it is impossible for a pet owner to estimate these risks. Therefore it is highly recommended to check and follow whatever local warnings and recommendations regarding tick-borne diseases. For the pet owner it is important to be aware and on the alert. If ticks are found on the pet they must be removed, preserved (e.g. in alcohol) and brought to a veterinary doctor for determining the species. Knowing the tick species indicates which diseases may have been transmitted. Afterwards the pet has to be carefully observed for whatever abnormal behavior: fever, lack of appetite, abnormal movements, etc. It is good to know, that when inspecting a pet for ticks, what most pet owners will find are more or less engorged adult ticks, which can be between 0.5 and 2 cm long, something between a rice grain and a large bean. Unfed adults reach 0.2 to 1 cm, depending on the species. Engorged larvae are usually 1 to 2 mm, too small to be detected by the naked eye. 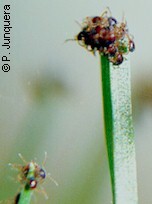 Engorged nymphs reach 2 to 5 mm, small enough to remain unnoticed by most pet owners. Unfortunately larvae and nymphs are also capable of transmitting diseases. However, larvae and nymphs of many species prefer smaller hosts (rodents, birds, rabbits, etc.) and are less likely to infest dogs or cats. There are no vaccines to protect pets against most tick-borne diseases and the best prevention is to avoid visiting tick territory during the tick season, or to thoroughly inspect pets after such a visit. Pets and other animals becoming infected with tick-borne diseases can be treated with specific antibiotics and other supportive medications. But it is crucial that the disease is correctly diagnosed as fast as possible after infection. Click here to view the article on NATURAL CONTROL of ticks in dogs and cats (prevention, natural tickicides, medicinal herbs, vaccines, biological control, etc). Click here to view the article on CHEMICAL CONTROL of ticks in dogs and cats (spot-ons, collars, pills & chewables, injectables, shampoos, soaps, sprays, baths, powders, etc).